Media: graphite pencil on white paper. 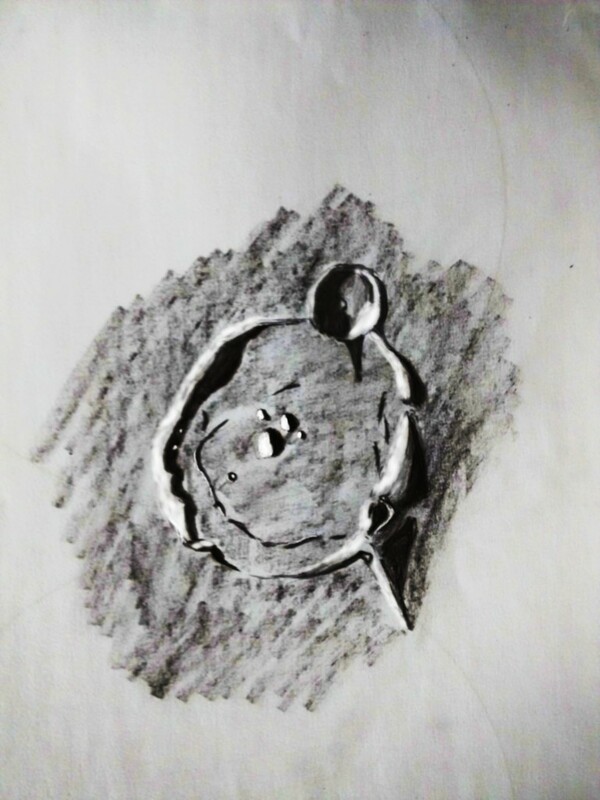 This is a sketch of the crater Gassendi, one of the most beautiful “fractured floor craters” on the moon. The sketch was made through my 6” achromatic refractor (TS Individual 152/900), binoviewer, a pair of 8 mm eyepieces and glasspath at 293x. The seeing was variable, usually bad but with very good moments of few seconds that allowed me to perceive the structure called “Rima Gassendi”: a pattern of fractures inside the crater. I hope you to enjoy with this sketch. If you wish to read more about this observational report and others, please visit the web of my astronomical group (www.laotramitad.org). A nice crater! Looks like a diapo ne on a ring. Very nice sketch. This is a nice capture of an interesting crater! you must be very happy with the result. Incredible sketching!! Great shadows and light areas. Thank you very much for your comments! I´m really happy with this sketch.